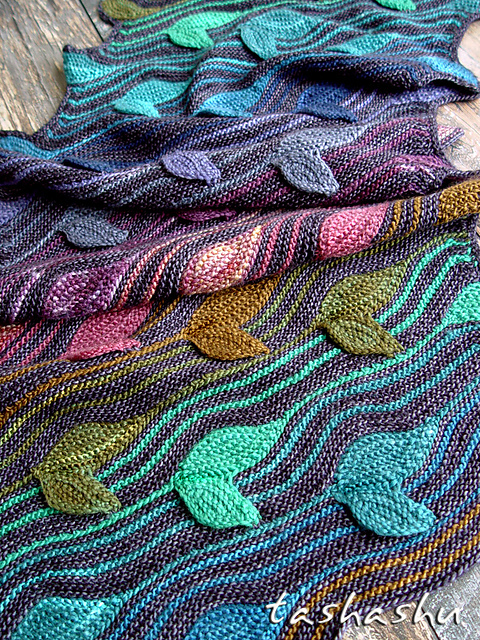 The Olympics are over and my sweater has finished blocking (just in time for a few lovely, cool days). I love my new sweater, and there’s no denying that speed knitting can be very satisfying, but now my mind is wandering to a new project. Something that I can really sink my teeth into, something I can work on slowly and carefully. Something stupidly elaborate and full of ridiculous details. 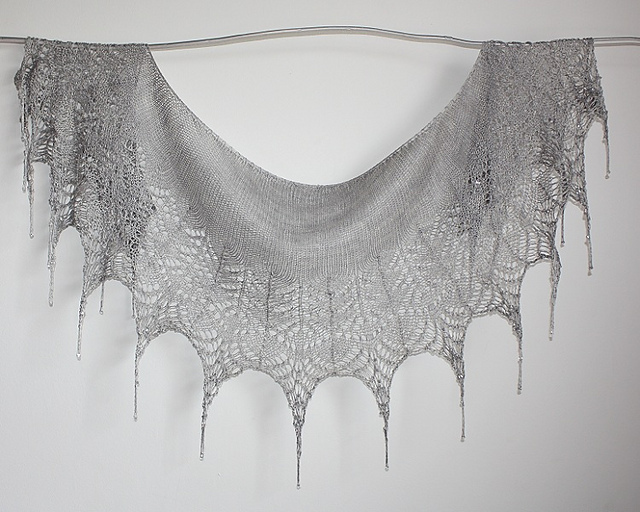 Snood Forest Witch by Svetlana Gordon And every time I see this project go across my screen, my heart skips a beat. I love looking at all the beautiful colors people choose. 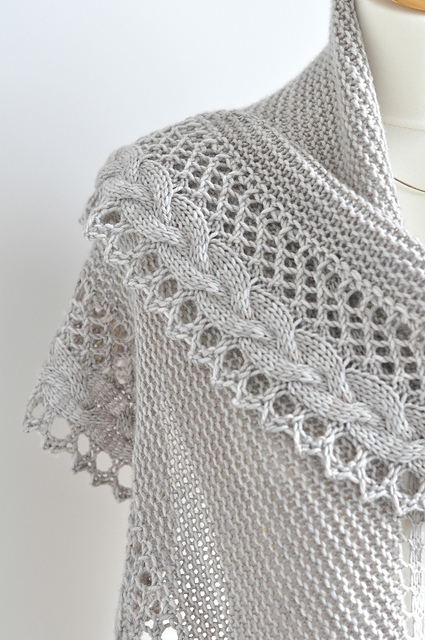 And, honestly, I can’t even guess how it’s constructed (short rows, maybe?)! 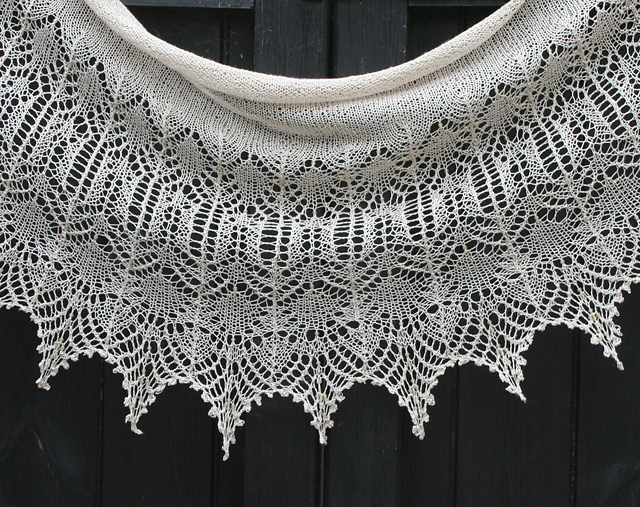 Lily-of-the-Valley-Rosea by Alla Borisova What do you like to work on when you’re looking for a complicated, careful knit? 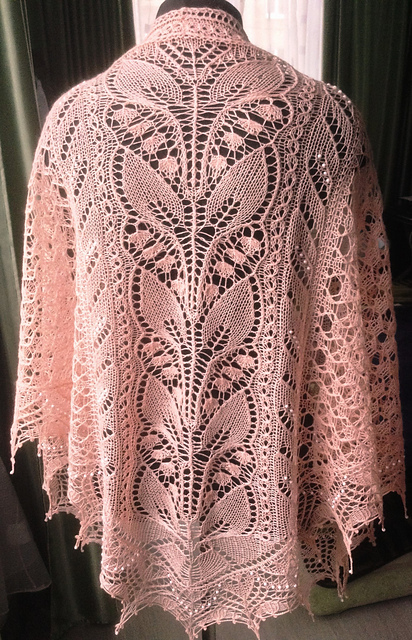 This entry was posted in Inspiration and tagged careful, fox paw, knitting, lace, scarf, shawl, short rows, wrap on August 24, 2016 by onemilljellybeans. It’s officially been summer for about a week, and it is officially summer. It’s hot and muggy and there isn’t even a breeze. 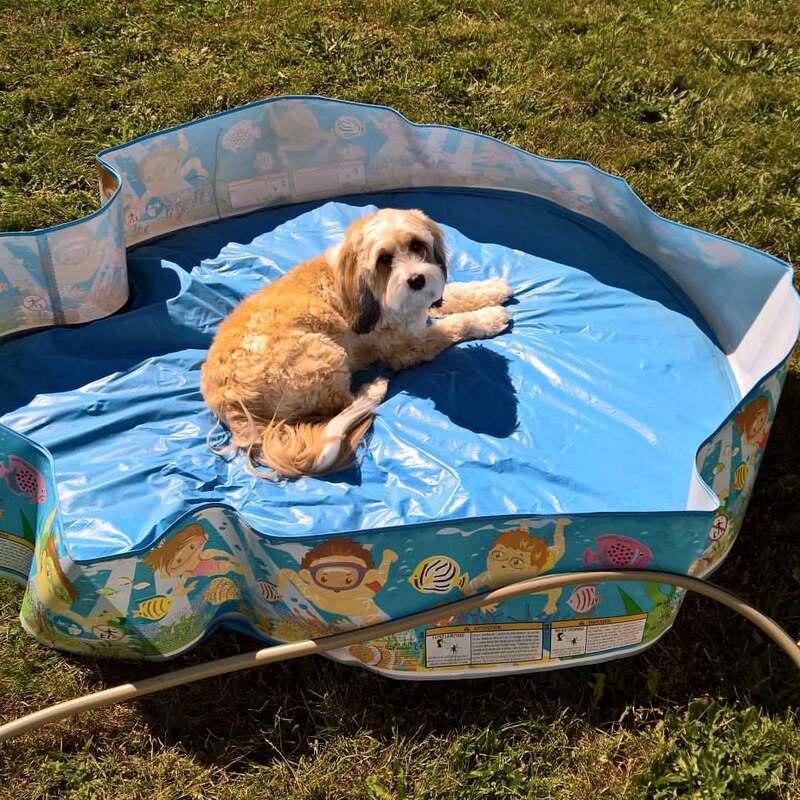 Ollie agrees- he needs a haircut, and is impatient for us to fill up his kiddie pool. I’m currently working on a big cabled sweater (a Christmas gift for someone, so I can’t tell you about it) which is just too much to be knitting right now. All that wool! What I’d like to be working on is something light and breezy. Something at a tiny lace gauge. A lovely, summery tank top. 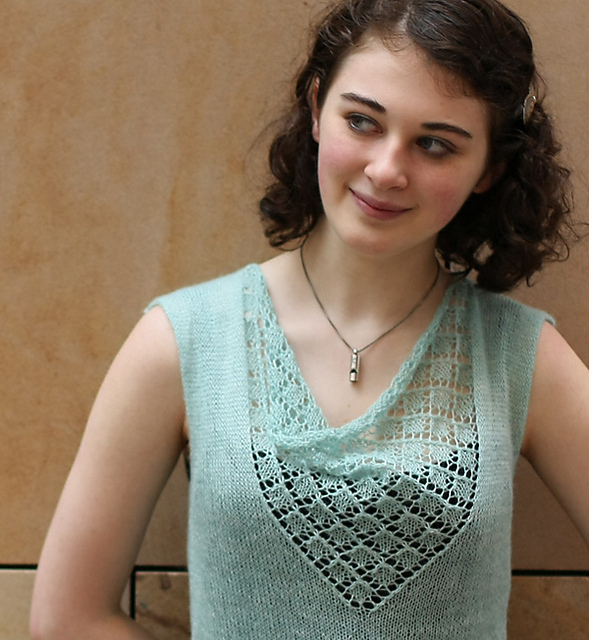 This tank is simple, drapey and lovely. If I worked in an office, it would be super cute to wear with a blazer or a light cardigan. Bonny by tincanknits I love the little details on this top- the tiny cap sleeves, the delicate lace at the hem, the split sides. So cute! 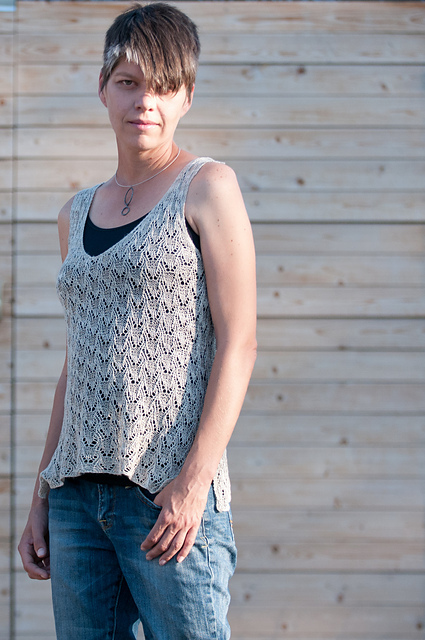 22.2 Top with lace edges by Karen Noe I love the all-over lace and the flattering, swing-y shape. I would totally wear the heck out of this tank. 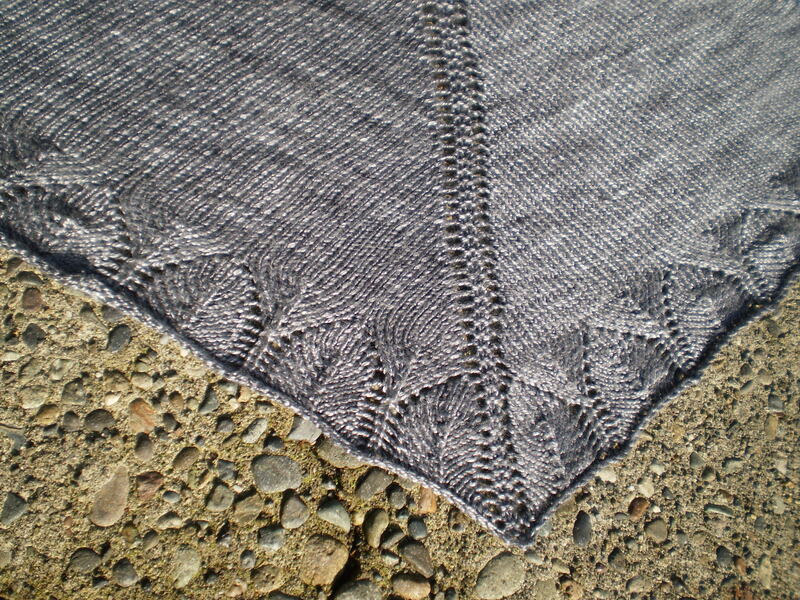 Just a Wisp by Pamela Schwab I can’t wait to finish the big sweater so that I can make myself a new tank top or two. 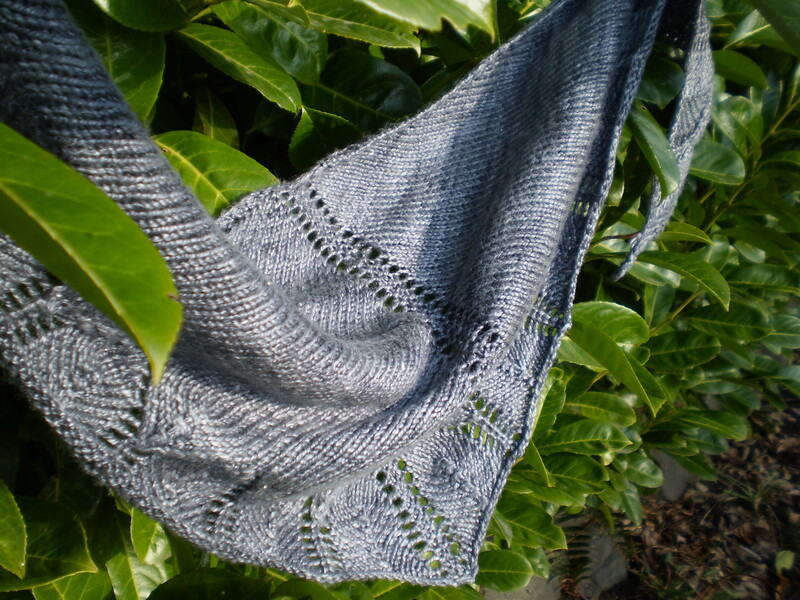 What summery projects do you like to make? 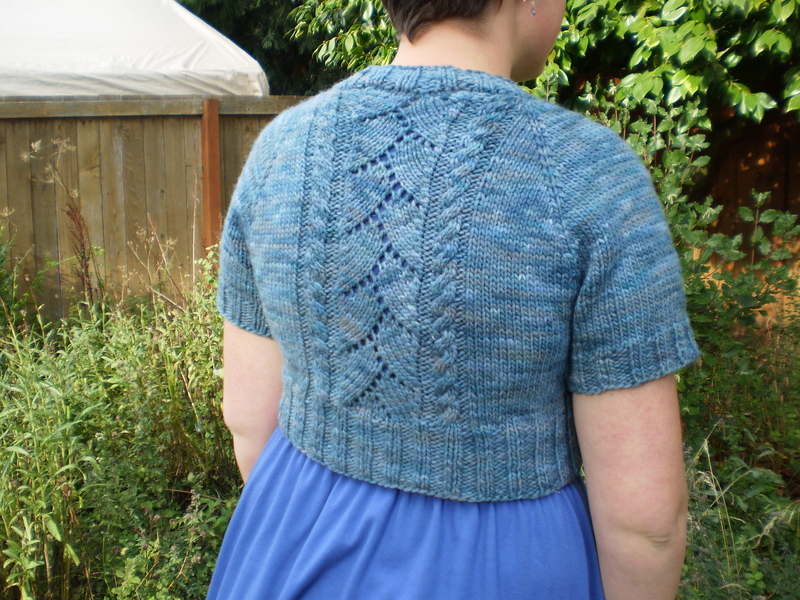 This entry was posted in Uncategorized and tagged knit, knit top, knit tops, lace, light, summer, tank, tank top on July 1, 2016 by onemilljellybeans. We’re Knitters. And, as Knitters, we knit for the people we care about- family, friends, neighbors, especially around the holidays. I’ve been knitting my fingers to the bone doing my best to finish everyone’s gifts before Christmas. And now that Christmas is done- well, I’m a little at a loss. 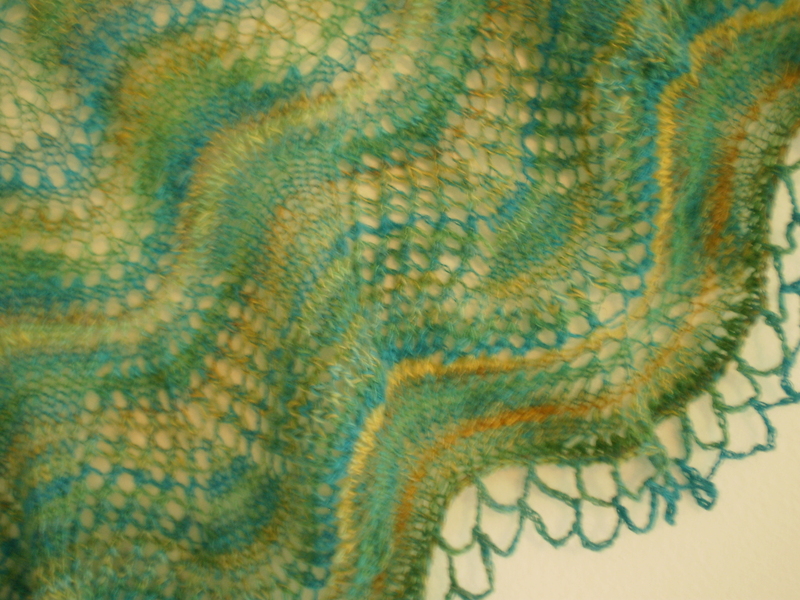 Now it’s time for what I’m dubbing the First Annual Knit For Yourself Month. 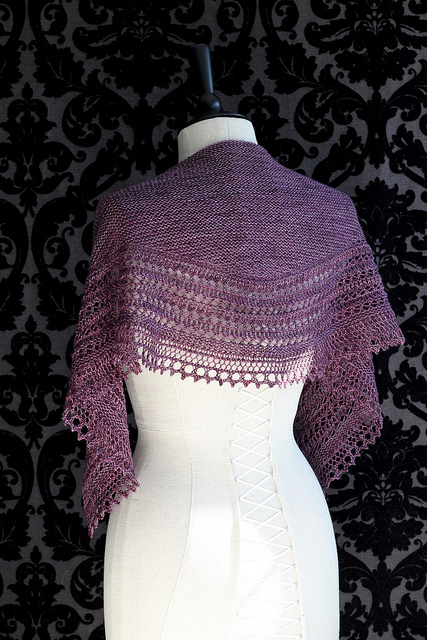 Let’s celebrate January by knitting for ourselves! 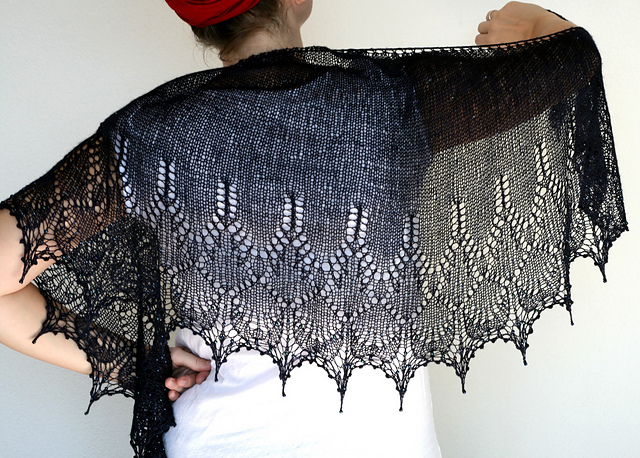 I’ve gone through my stash and gone through my Ravelry Queue, and picked out three projects that I could totally work up without even stopping by my LYS (although, I do love a good trip to my LYS). And the best part? These projects would be just for me! 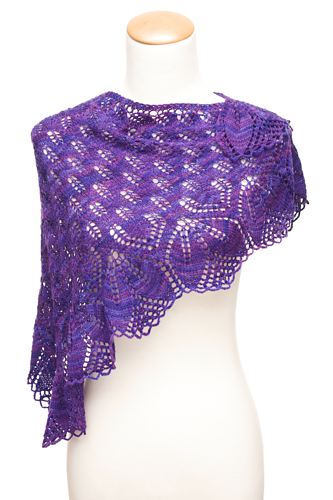 Haruni by Emily Ross Or, I could make a sweater- I do love a good sweater. I saw a group of girls wearing this sweater (they each had one in a different color) at a knitting conference last year. it was super flattering and adorable over dresses. Look at that cable down the front- beautiful! And, since it’s cropped, I bet I have enough yarn on hand. Or, I could make a dent in my sock yarn stash. 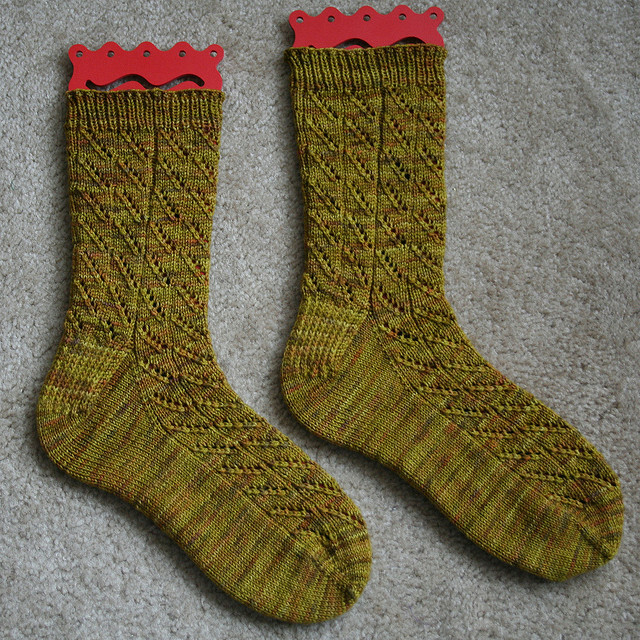 After all, I made socks for everyone else in the family, I might as well make myself a pair, too. 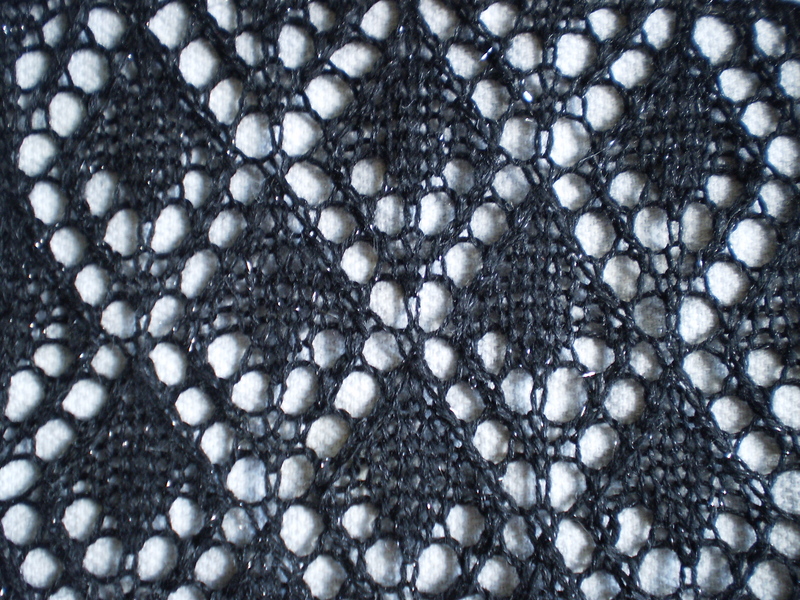 And, these cute little lace guys have a toe-up heel flap- a technique I’ve been meaning to try. 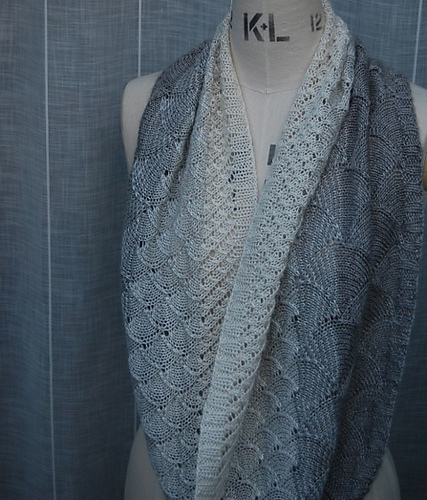 What would you like to work on for Knit For Yourself Month? 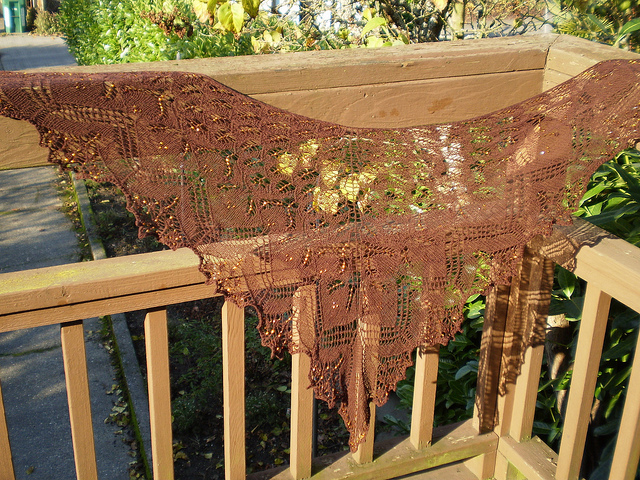 This entry was posted in Inspiration and tagged after christmas, cable, knit for yourself, lace, shawl, socks, sweater, toe up, toe up socks on January 4, 2016 by onemilljellybeans. Whee! That went way faster than I thought it would! 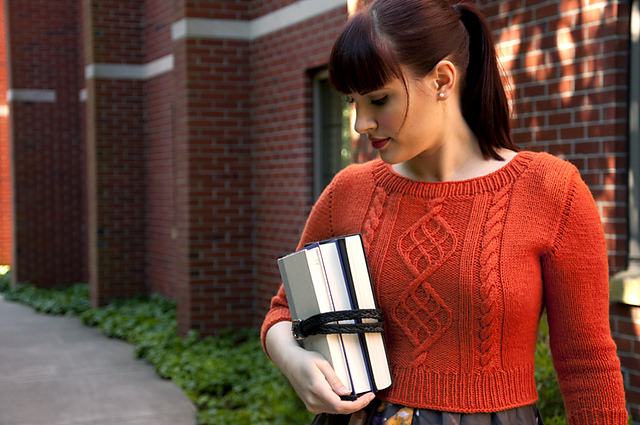 I guess when you make a cropped, short-sleeved sweater in bulky yarn, it goes really fast! Who would have thought? 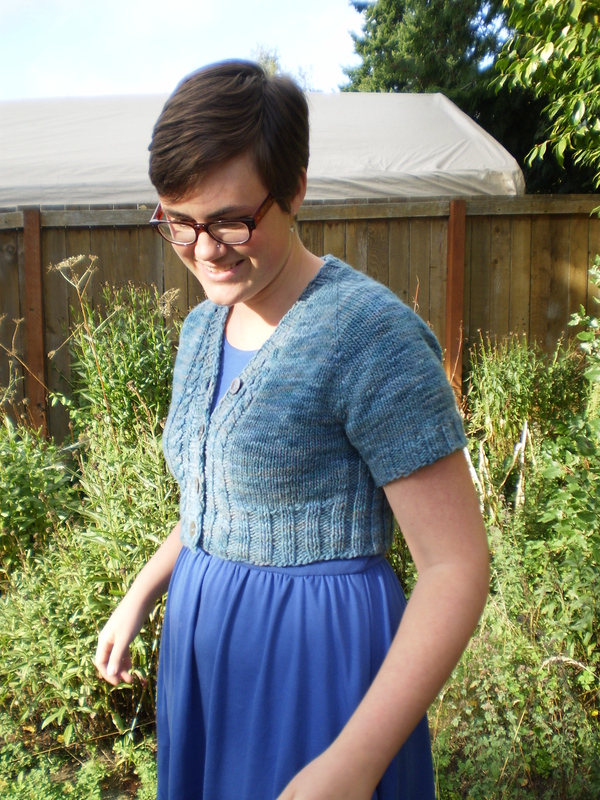 This sweater, from casting on to binding off, probably took about a week! I should make all my sweaters like that–size 10s forever! Like I said before, I worked this sweater as a top-down raglan with a V-neck, based on Ann Budd’s book, so I didn’t have to do any math. (Even math nerds like me enjoy a break from time to time.) 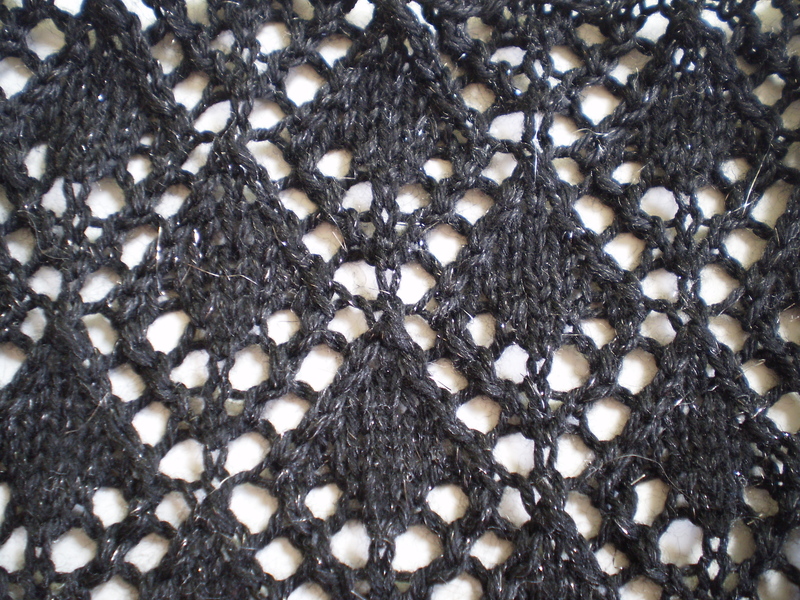 And, as I went, I added cables and lace from my Japanese pattern book. 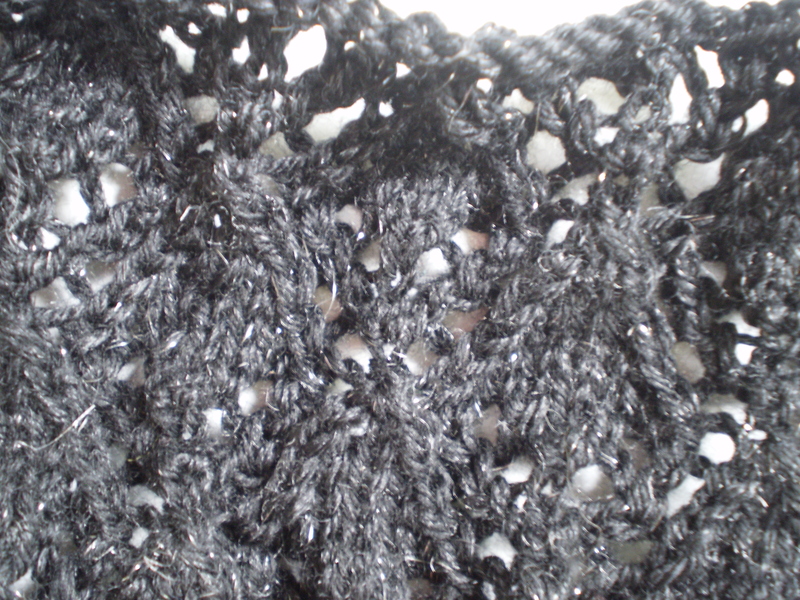 Meanwhile, I added a little k2p2 ribbing to make the sweater a little more fitted without having to worry about doing actual shaping. It’s a trick I picked up years ago. 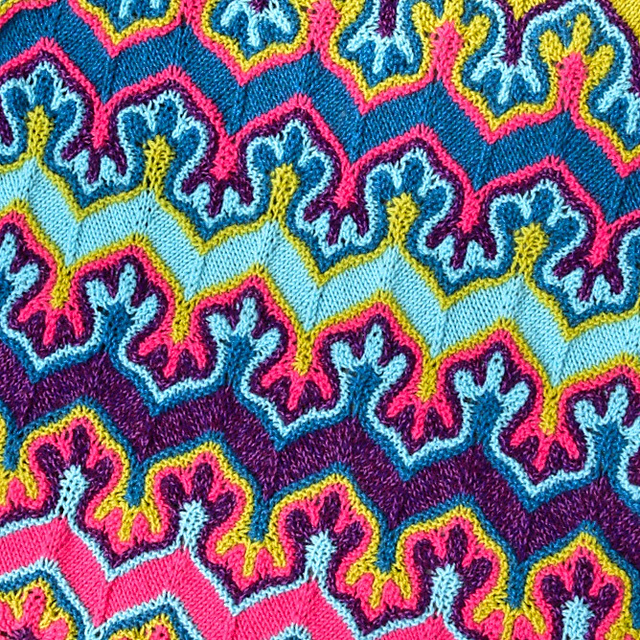 K2p2 ribbing is the stretchiest/most elastic stitch pattern, so it can act as elastic, pulling the sweater tight, when you work it in panels on the sides of your sweater. I also added a nice wide ribbed waistband and cuffs. I’m so happy with how it turned out! I have a bunch of high-waisted, summery dresses, and now I can wear them with this sweater and a pair of tights all the way through winter! Have you ever made a project in less time than you expected? 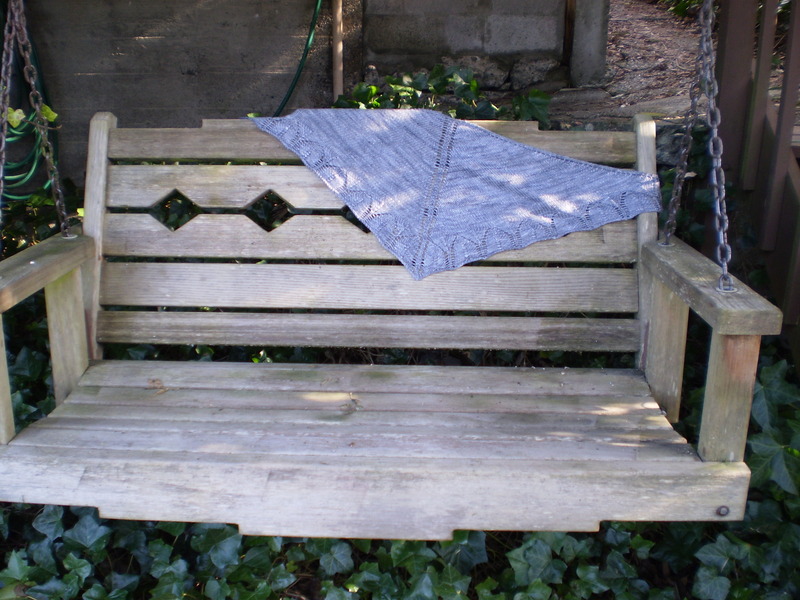 This entry was posted in On My Needles and tagged ann budd, cable, cardigan, cropped, dress, dress sweater, lace, raglan, short, sweater, top-down, v neck on September 23, 2015 by onemilljellybeans. Phew! 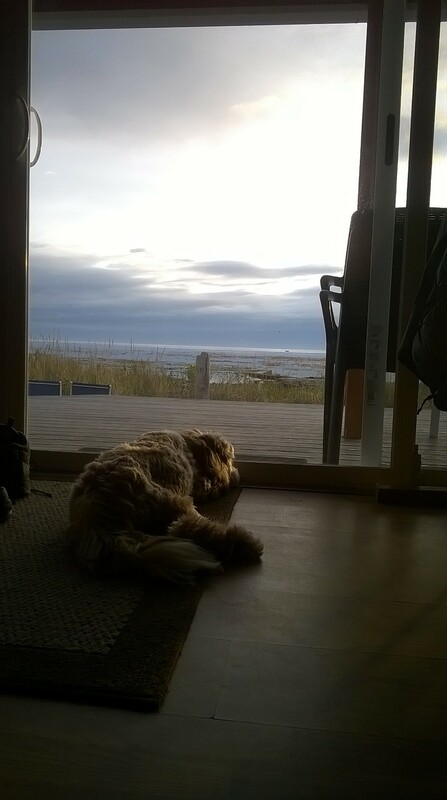 I just got back from a whirlwind trip to Sequim, a little coastal town on the Olympic Peninsula. It’s pronounced “Squim” (rhymes with “him) it’s as fun to say as it is to visit! 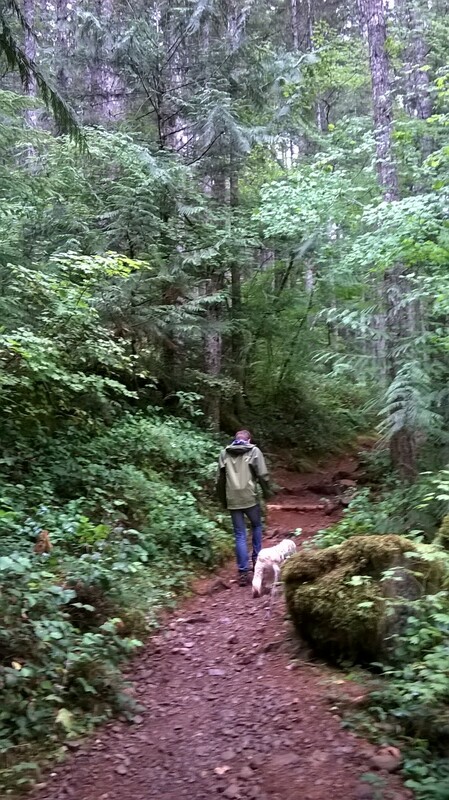 We spent 4 days hiking on Hurricane Ridge, tide pooling on Rialto Beach, and eating delicious local seafood. Ollie spent his days barking at seagulls, running after seagulls, and trying to eat seagull poop. And what else did I do? Oh, right… knitting. After all that relaxation, I’m ready for another vacation! 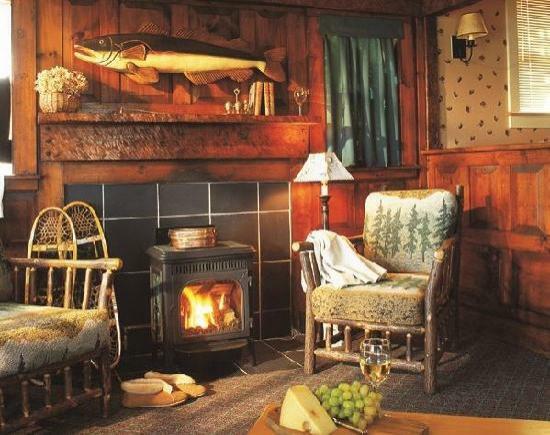 What do you like to knit while on vacation? 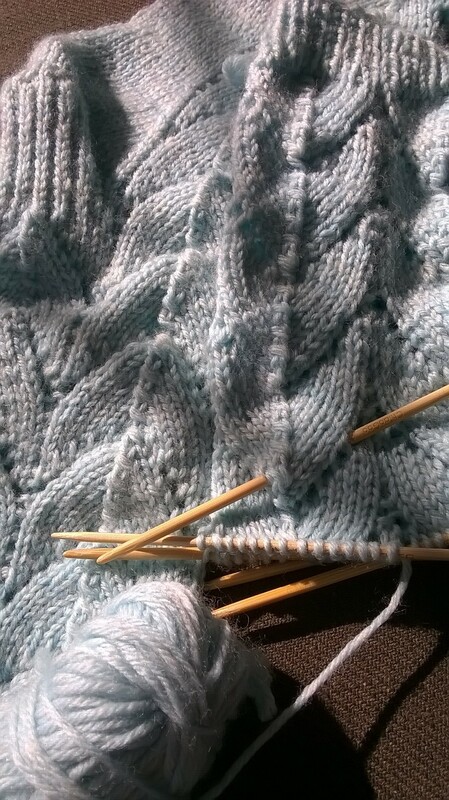 This entry was posted in On My Needles and tagged hurricane Ridge, knitting, lace, olympic national park, olympic peninsula, peninsula, rialto beach, sequim, socks, vacation, vacation knitting on September 9, 2015 by onemilljellybeans.